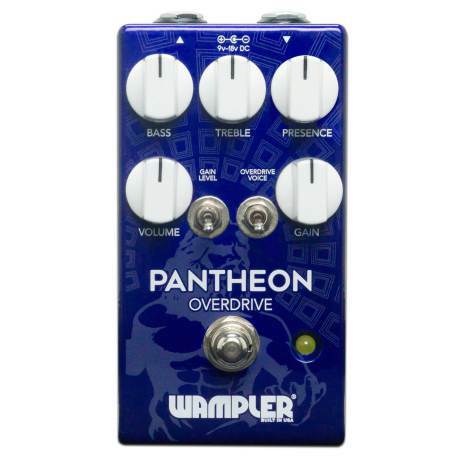 The Wampler Pantheon overdrive pedal was inspired by combining the long-discontinued original Marshall BluesBreaker pedal and a legendary derivative of that circuit – a pedal that became the “King Of transparent Tone”. 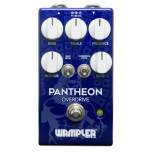 These pedals are extremely hard to find and usually out of most people’s reach when they do finally find them - the Pantheon is available immediately now and will be in the future with NO waiting list. The Pantheon proudly exudes the familiar break up and tonal nuance of those sought-after circuits that enhances any guitar and any amp’s natural voice. The Pantheon has a special kind of tone that we describe as chewy yet crunchy and it sounds great into both dirty and clean amps. It’s VERY touch sensitive, much like you’d find when playing an amp that’s breaking up. As always, Brian Wampler has created a meticulously tweaked EQ stack to give the player the control they demand and have come to expect from any Wampler pedal. The perfect fat bass, and the perfect level of chime - it’s all here; it can be added, it can be taken away. The Pantheon is the perfect way to add just the right amount of expressive dirt to your sound without losing any of what makes the player, simply… them. The Pantheon features three levels of gain saturation to go from just breaking up to all-out dirt, a second toggle switch going from classic BluesBreaker configuration to a clipping texture closely resembling what you’d find on the mythical KOT style pedals, and a presence control that’s on the front and not hidden away inside. Shaping the tone of the most coveted “BB” style pedal has never been easier. As with every Wampler, Brian has taken the time to make sure all the EQ stacks and gain options work together perfectly. With the 3 levels of gain and the 3 different overdrive voicings, you can find almost every BB tone in this one pedal. The Pantheon retains the clean simplicity of layout that our pedals are known for – you won’t have to spend days studying a manual to get the best from the clean and uncluttered layout. Any player that gets their hands on this pedal will get lost in its versatility, the control, the tone… it’s one of those pedals that takes the player on the kind of journey into gain that we’ve all dreamed about. Once they get to the other side, their rig will sound better than ever before and mark a new era of tonal perfection. style circuit you and your customers have been waiting for. 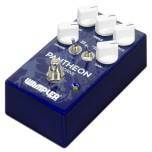 The all new Wampler Pantheon, making the unavailable and elusive perfect BB tone a thing of the past. It’s here, it’s available, and it’s ready to fly off your shelves.